Chic bedroom decor in soft white and light blue color tones enhance interior decorating in classic style and create a peaceful and comfortable room with luxurious bedroom furniture and lighting. 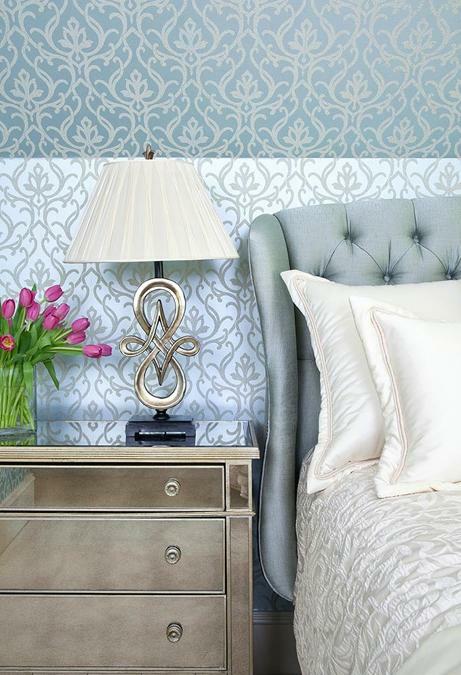 Beautiful interior design and decorating ideas by Jennifer Reynolds impress with splendor and elegance. Gorgeous bedroom decorating ideas in classic style demonstrate wealthy, pleasant and stress-free lifestyle. Quiet and soft white and blue color scheme make this bedroom decor look sophisticated and welcoming. 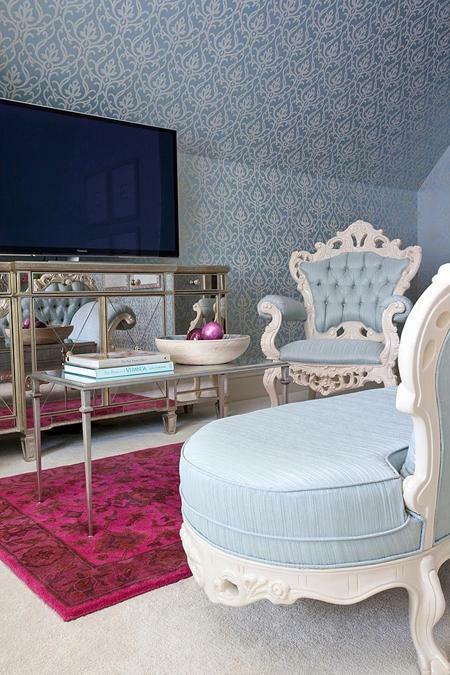 Pleasant off white and light blue color scheme is tender and sensual, creating a sense of spaciousness and peace. Light blue color shades, especially pale pastel blue color tones are popular trend in decorating which creates spectacular, elegant and stylish bedroom decor in classic style, reflecting the way people want to live and rest. Light blue color shades are calming and bright, create an amazing, relaxing and inviting atmosphere which people want in their bedrooms. 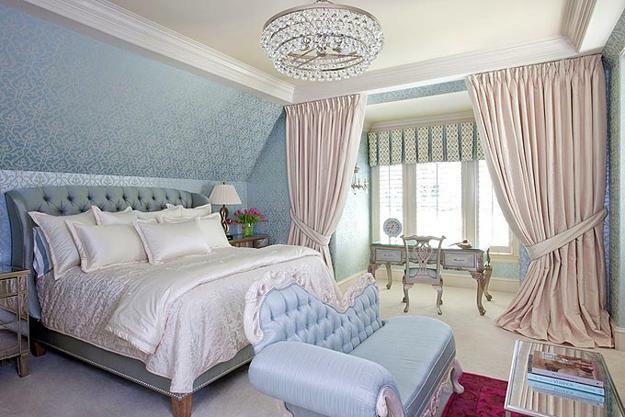 This guest bedroom decorating with a stunning white and blue color scheme create a beautiful room for sleeping and relaxation, marrying interior decorating ideas in classic style with luxurious bedroom furniture and lighting, comfort and functionality, nice things that people want to surround themselves with. This guest bedroom decor is expensive, ideal for wealthy people who love and appreciate the charm of royal elegance and classic style. All bedroom furniture, decor accessories, lighting fixtures and a bedding set are selected with the utmost care and complement interior decorating color scheme which symbolizes freshness, peace and elegance. The creamy white and light blue color combination is harmonious and balanced with wooden brown color shades and rich purplish pink accents. The white and blue color scheme is gentle and aesthetically appealing, creating breathtaking bedroom decor ideas that impress with exclusiveness and elegance. The pale blue color is the main interior decorating color, which is not boring or striking. 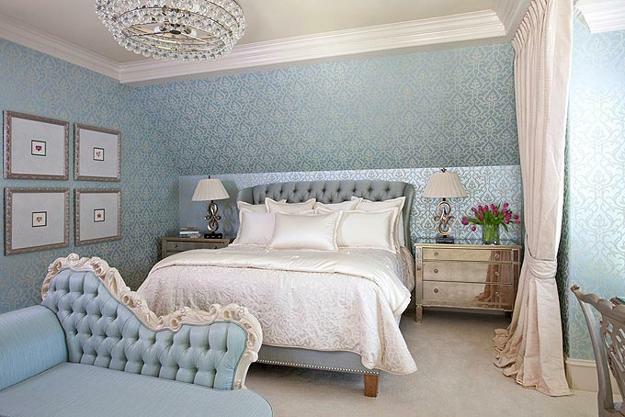 Beautiful wallpaper pattern and upholstery fabrics in light blue color tones enhance the classic style and create a cooling, breezy and relaxing effect, ideal for bedroom decorating. Classic bedroom furniture and table lamps, standing on the bedside tables, compliment the beautiful wallpaper pattern in classic style. The ceiling is decorated with stucco and an elegant crystal chandelier. Gorgeous curtains divide the room into two zones, filling interior decorating with romance. The beautiful curtain fabric compliment the luxurious bedding set, bringing harmony into blue bedroom decor in classic style. Modern bedroom furniture and decor accessories attractively blend with bedroom decor in vintage style. The contemporary TV panel which is placed on a mirrored furniture piece help visually increase the room while providing comfort and convenience. 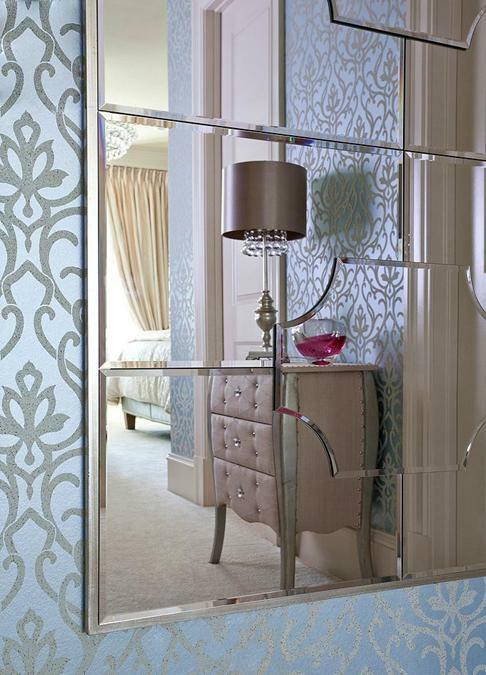 The mirrored surfaces enhances the space and add a character to bedroom furniture item that reflects and multiply chic bedroom decorating ideas. The wall mirror just increases the effect. The purplish pink floor carpet brings a rich color into white and light blue color scheme and add interest to classic bedroom decor ideas, creating harmony with fresh flowers and decor accessories, a glass vase and decorative balls in purplish pink color. The interior design ideas in classic style, romantic, fresh and luxurious interior decorating with white and light blue color scheme and chic furnishings add chic and elegance to this room, creating comfortable and cozy guest bedroom decor.